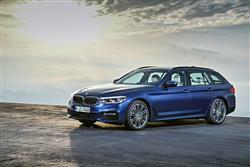 BMW has high hopes of its much improved 5 Series Touring. Jonathan Crouch reports. 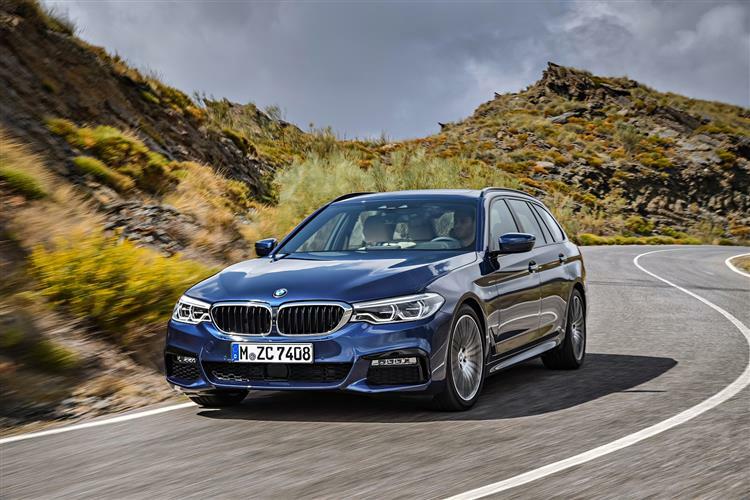 Big estate cars have come a long way from their utilitarian roots and the seventh generation BMW 5 Series Touring is a good example of just how far. Air suspension at the rear offers composure with a big load onboard and you'll be able to fit plenty in one in thanks to a 570-litre capacity. The engine range is now even more efficient and the smartened styling, though formulaic, has definite elegance. It may even be sharper than the saloon's. 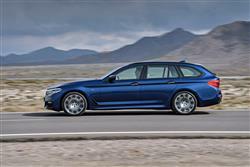 BMW paints a not unrecognisable picture of the executive estate market before the arrival of its 1991 first generation 5 Series Touring. Before that car, big estates were pared-back workhorses to their sportier and more sophisticated saloon counterparts. After it, they were positioned more equally with equivalent design and driving dynamics. Today, many even see the estate as a more stylish alternative to the straight-laced saloon, with its extra practicality coming as a handy bonus. The MK7 model 5 Series Touring is a worthy successor to successful previous generation models and just like most of its predecessors, it has the Audi A6 Avant and Mercedes-Benz E-Class Estate to contend with. BMW's expertise in autonomous driving systems and media connectivity will help here, as will the greater luggage capacity on offer. If all of this can shroud a car that cossets its passengers while still rewarding the driver at the wheel, then quite a contender is in prospect. The main news on the engine front concerns petrol power. There's a fresh 252bhp 2.0-litre four-cylinder unit in the 530i that's 7bhp up on the old 528i or alternatively, there's a 340bhp 540i variant which needs xDrive 4WD to control its prodigious 450Nm of torque. 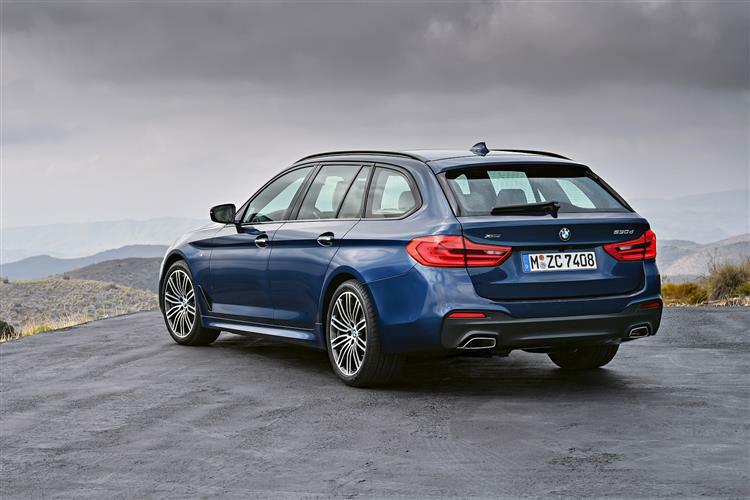 Most 5 Series buyers though, will continue to want a diesel, probably the familiar 190bhp 2.0-litre four cylinder unit used in the 520d, which in a 5 Series must be mated to an 8-speed Steptronic auto gearbox. The alternative is the six cylinder 265bhp 530d which has 620Nm of pulling power. Both these variants are available with optional xDrive if you want it. For the first time, BMW xDrive can be combined with Integral Active Steering, as well as lowered sports suspension. As for handling, well a step forward was needed here with many commentators reckoning that the previous generation model was too comfort-orientated in its standard guises. This time round, BMW's engineers reckon they've achieved a much better balance of performance and luxury thanks to reductions in weight, revised steering and new double-wishbone kinematics in the front axle. This Touring model is styled the way you would expect it to look. So from the B-pillar forwards, the front is identical to the saloon, but at the rear end, there are enlarged LED tail-lights and there's a sleeker roofline than was offered by the previous generation model. This time round, the car is 36mm longer too - though it's no longer than the current saloon variant. Get out the tape measure and you'll find that it's 8mm wider and 10mm taller than the previous car, while the wheelbase has increased by 7mm. Boot capacity is up to 570-litres, which is 10 litres more than before and 40 litres larger than the saloon. The rival Mercedes E-Class betters that though, with its 640-litre capacity. In response, BMW says the boot can expand to 1,700-litres with the rear seats down - that's 30 litres more than the old car. Those seats, which fold in a 40:20:40 split, can be released remotely from the boot and have electrically folding backrests. All models get an electric tailgate, while the unique opening rear window is retained from the previous model. As with the saloon, 'Professional' navigation, telephone, entertainment features and vehicle functions can be visualised on the standard high-resolution 10.25-inch screen and controlled not just in the usual manner using the iDrive Controller, but also by means of gestures, voice commands or simply touching the buttons on the touch-sensitive display. On to pricing. Expect to pay a required premium of just over £2,300 to get this Touring estate 5 Series model, rather this four-door saloon. That means pricing somewhere in the £38,500 to £48,500 bracket for mainstream models. All variants come only with eight-speed automatic transmission and if you avoid the base 520d diesel derivative, you'll get the 'Sport' version of this gearbox which offers quicker change characteristics. Very few 5 Series Touring buyers do avoid the 520d however. In fact, almost 85% of customers choose this 190bhp model. There's quite a purchase price jump if you're to consider any other engine in the range. 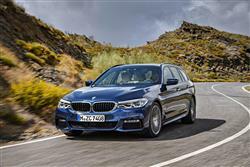 The petrol models start with the 252bhp 530i at around £42,000, but a better bet would be the 530e plug-in hybrid variant which uses the same 2.0-litre four cylinder engine and won't cost you much more, once the available government grant has been subtracted from its asking price. 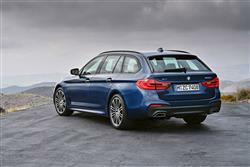 Step up to 3.0-litre six cylinder power and you'll need a budget either just below or just above the £47,000 mark if you're to consider either the 265bhp 530d diesel or the 340bhp 540i petrol variants. 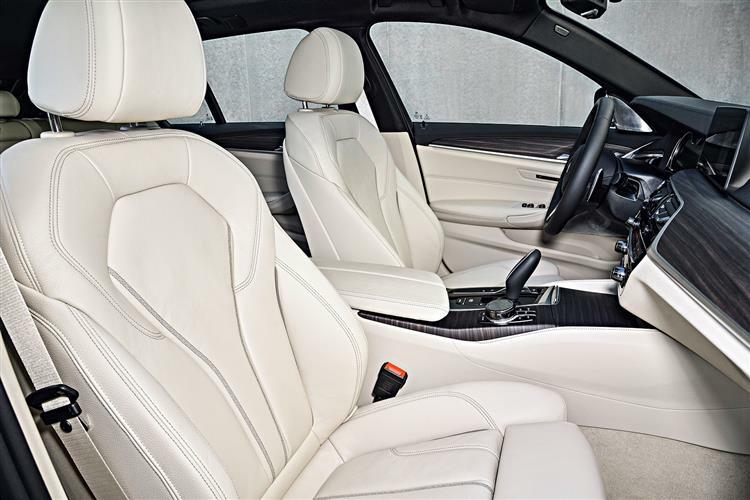 The brand's xDrive 4x4 system is standard on the 540i and offered at a premium of around £2,000 on the two main diesel models. The four-cylinder diesel engine powering the BMW 520d manages over 65mpg on the combined cycle, resulting in CO2 emissions of under 115g/km. 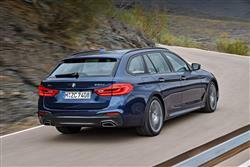 Go for the six cylinder 530d and you can expect close to 60mpg, equating to CO2 emissions of under 130g/km. Even the petrol units don't do too badly. The potent 540i xDrive returns over 35mpg with CO2 emissions of under 170g/km - a reduction of 11% over the previous model. The diesel exhaust systems operate using BMW BluePerformance technology, which combines close-coupled particulate filters and oxidation catalysts with a NOx storage catalyst. Exhaust gas after treatment in all diesel models is performed with the aid of SCR technology, including a water-cooled metering module for the AdBlue fluid, which serves to cut nitrogen oxide emissions still further. Plus the 'Drive Performance Control' system has an 'ECO Pro mode with Proactive Driving Assistant' option, which works with the 'Professional Navigation' system to detect braking situations in advance. What else might you need to know? Well, routine maintenance is dictated by 'Condition Based Servicing' that monitors oil level and engine wear, taking into account how long it's been and how far the car has travelled since its previous garage visit. You can check all of this using menus in the 'iDrive' centre-dash display and the car will give you four weeks' notice of when a check-up is needed so you have plenty of time to book it. 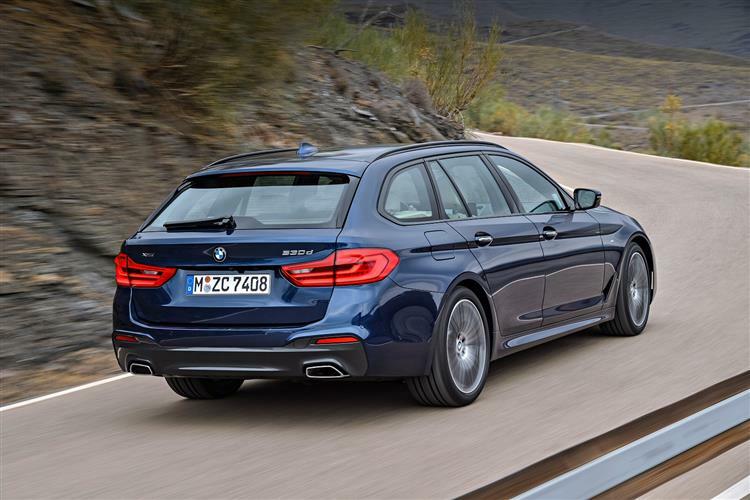 Why would you choose the estate version of an executive car over the saloon? A few years back, you'd have wanted the additional boot space and would have been willing to make some compromises to get it. 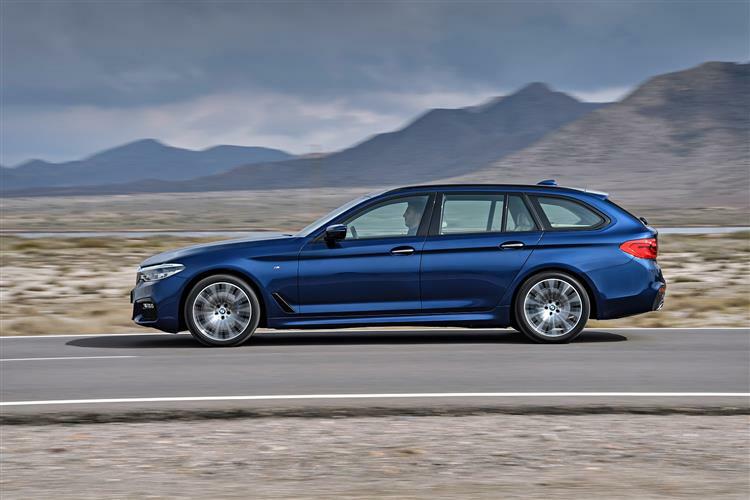 Today, cars like this much improved BMW 5 Series Touring combine the technology and driving experience of the saloon version with real additional versatility and sharp looks that many will actually find preferable. Whichever way you look at it, the latest 5-Series 5-door has an array of capabilities that few cars of any description can match. True, it's a pity that to really create 'the ultimate driving machine', you've to spend so much on the options list. But even in standard guise, this is a hugely accomplished car, if one requiring familiarity and plenty of mileage over varying roads before its true qualities really begin to shine through.